The present volume is based on the Bengali book Galpe Vedanta, published in Bengali in the centenary year of Swami Vivekananda’s birth. But it cannot really be called a translation since the stories appear in a different order, and many changes and additions have been made. This version of the book is for young English-speaking students who might want to take a quick and painless look at Vedanta. But is there such a thing? Vedanta must be approached, with caution, even by the intellectually advanced, for it is a bold and subtle philosophy which, in its highest form, can cause giddiness. 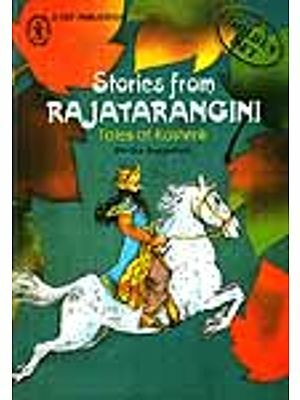 But whether or not they understand the far-reaching implications of the stories and anecdotes narrated in this book, young students will certainly widen their religious outlook if they only grasp their basic principles. For one thing, they will see that it is possible to accept the fundamental propositions of different religions without abandoning rationality. And then they’ll be ready, if they are so moved, of more advanced studies in Vedanta. There are a vest number of readers who need and deserve such a book, and they must have it if we are to weave a strong and beautiful fabric out of the many religions threads that makes up this far-flung world of ours. Sir Isaac Newton made certain grand scientific pronouncements toward the end of the 17th century. Since then, the advance of science has offered educated people a front-row seat in the inner recesses of the physical universe. But at the same time, many of these people have turned their backs on God and the soul. This seeming allergy to religious ideas was especially prevalent at the turn of the 19th century and the beginning of the 20th. The edifice of science, built on Newtonian ideas, had grown to include its offshoot, technology. Remember that the motorcar was then being commercially manufactured, and the airplane was being invented. But just then, another contender strode into the scientific arena. In the first decade of the last century, a man named Albert Einstein published two articles, which together, initiated the undermining of the foundation of the Newtonian edifice. Einstein’s postulates and his way of looking at radiation led the way for other scientists to work out the Quantum theory within 20 years. Within another 20 years, the discovery of the subatomic world and a host of elementary particles, and the idea of the Anti-Universe, had led scientists to abandon completely the ideas which had explained Newton’s universe. Physicists realized that their ‘laws’ had been created within the mind. They began to understand that the universe, including consciousness, is an inter-connected whole. On the other hand, shocks of unprecedented adversity in Europe and elsewhere during the Second World War revived certain ancient values, like love and brotherhood. Philosophers and savants of the West gradually came around to the view that these values are based on the truth attained by mystics who rose to suprarational consciousness. Thus the rapid strides of physics and the lamentable consequences of the World War combined to rouse the curiosity of the best minds about human consciousness and its latent possibilities. When that happened, India’s Vedanta began to win many Western hearts. In fact, this was the beginning of a new generation of people who were models of sophisticated reason and also had a profound interest in Vedanta, the quintessence of Indian philosophies. But the forerunner of this new generation was a messiah of Vedanta named Swami Vivekananda. Swami Vivekananda sailed from Mumbai (then Bombay) for America about half a century before the gloom caused by the attack on Pearl Harbour descended on the mighty United States. He preached Vedanta in the United States and England, the dominant theme of his teaching being the spiritual oneness of the whole universe-both physical and mental. Vivekananda proclaimed that ethics could not be derived from the sponsorship of prophets; the real sponsorship was to be found in the infinite reality called Atman in Vedanta texts. He said: “. . . You and I are not only brothers-every literature voicing man’s struggle towards freedom has preached that for you-but that you and I are really one.” He asked them to verify, within their own disciplined minds, whether Vedantic truths were empirical. In the 17th century, Prince Darah Shikoh (the eldest son of the emperor who built the Taj Mahal) became the first to translate certain Vedanta texts into a non-Indian language. It was translations of his versions that first made Vedanta texts available to Europe, but it was Vivekananda and his followers who turned the philosophy into something living and potent among non-Hindu communities of the West. Scholars in the past had discussed Vedanta, mystics had lived it, and orators had discoursed upon it. But its subtle truths, before Vivekananda, had still proven elusive. 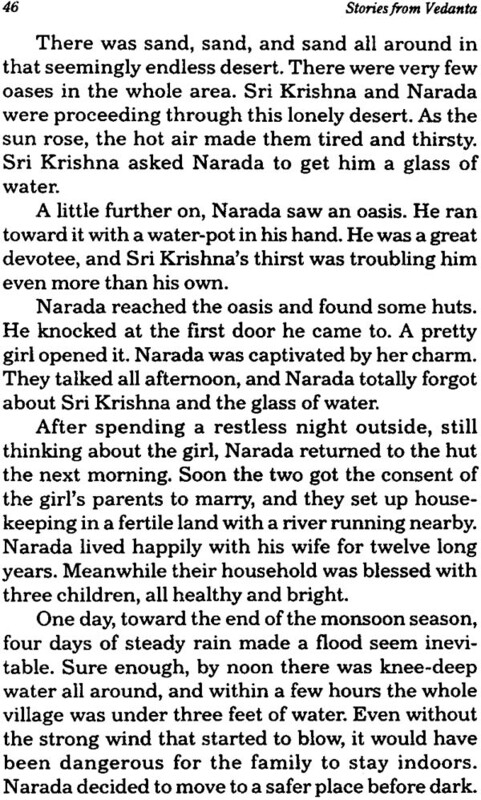 Indian sages of the hoary past, as well as god-men like Buddha, Jesus Christ, and Ramakrishna, have always used parables, fables, and illustrations from everyday life to impress upon the masses the fundamentals of their teachings. Vedanta texts are full of such accounts and illustrations without which it is very difficult to form a conception of these very subtle ideas, let alone hold on to them. Analogies nudge conceptual truths into a world where ordinary people can perceive them. It is true that the highest Vedantic realization consists in a person realizing his identity with the Thing-in-itself, or the Absolute, known in Vedanta as Atman or Brahman, but other stages of growth in the intuitive faculty of man have also been chronicled in the holy books of India and other parts of the world. All these stages are wonderfully accounted for in Vedanta. According to Swami Vivekananda, they are simply viewpoints taken by the soul as it soars to different stages in its spiritual flight. How can ordinary seekers dare to take such flights? They should begin by purging their hearts of selfishness, and then should direct their energy towards making their minds fit for receiving the grand vision described by seers throughout the ages. This book, which consists of well-known Vedantic stories as well as anecdotes from the lives of sages and savants, is intended for students having their first exposure to this philosophy. We firmly believe that this universal and rational philosophy will inspire all to put it into practice, without having to renounce the world to do so. They will do it in their homes, on farms, at factories. And perhaps, thanks to these budding Vedantists, we won’t have to wait long for the dawn of the Vedantic Age!